The following excerpt is taken from the Introduction to The ENLIGHTENED EDGE for LEADERS: IGNITE the POWER of YOU, by Barbara Bouchet. “The world needs you! It needs more people like you, people who are ready to ignite their power as a leader. As a reader of this book, perhaps you feel that your capacity as a leader hasn’t yet been fully realized. You may have a partial vision of something more you could accomplish, for others and for yourself. No doubt you have struggled to get where you are and know that getting to the next level will require added effort. You may suspect that not all obstacles are external–some may be internal. This book can help you identify and change whatever holds you back from being a more effective leader. This is a guide for making a powerful shift from a foundation that is guarded and limited to one that is rooted in expanded and realistic possibilities, a place I call the enlightened edge. The enlightened edge is a working space that becomes available when you challenge what is limited and distorted and you stand behind what is expanded and true. For example, when a leader challenges a crippling lack of confidence with a powerful assertion of personal and professional value, his or her enlightened edge expands. Or when a highly capable, intelligent but sometimes caustic leader links sensitivity with performance demands, he or she finds their enlightened edge. Most people live their lives without ever tapping into their potential, which bubbles quietly below the surface, systematically suppressed and diverted. You have probably had glimpses of your own potential. Now you have an opportunity to activate and effectively use it. The enlightened edge is different for each person; it can illuminate the next stage in your own growth as a leader. Working with your enlightened edge will strengthen the clear vision and presence that supports powerful and positive action. As you unlock the power and spirit that already reside within you, you’ll see yourself and others in a new light. Igniting your potential will enable you to lead others in a way that also ignites their potential. You’ll find faster and better ways to manage yourself, manage others, and get results. Leaders who don’t look inward often don’t fulfill their potential, despite their best efforts. By doing the work outlined in this book, you’ll discover both your potential limits and what could liberate you. Your blind spots will be identified; you’ll fill in the gaps, and learn to recover gracefully from mistakes. Your work will provide a foundation for working with both the light and the dark aspects of who you are, so you can lead with deep, inner confidence. As a leader, you can’t afford to deceive yourself or operate in a relationship vacuum. This book will show you how to influence others with integrity and vision, so they will be inspired to follow. You’ll learn how to strengthen the clear thinking and clear feeling that are necessary for highly effective communication. This process will assist you in building collaborative relationships; you’ll be equipped for greater success with challenging conversations as well as getting difficult relationships back on track. Until now, many of the models and processes outlined in this book, such as the Limited You and Essential You, Shadow Gratification™, Reactive Patterns, Relational Patterns, and the Contact-Zone™ have only been available through the coaching or training I offer to executives and professionals. This book now makes available to you the same information that has helped CEOs, vice presidents, directors, managers, business owners, independent professionals and entrepreneurs, become even more capable, wise and balanced leaders. I have worked as a psychotherapist, adult educator, executive coach and organization consultant for over 25 years. I own my own business, was executive director of a non-profit corporation, started a consulting firm, and have been an associate with other consulting firms. As a consultant, I’ve worked with many large companies like Microsoft, Costco and Philips Health Care, as well as many small companies and non-profit organizations. I provide executive coaching, leadership and team development, strategic planning, conflict resolution and often am relied upon as trusted advisor. I have also worked privately and confidentially with many leaders in healthcare, global e-commerce, engineering, information solutions, auto manufacturing, banking, business law, global investing, environmental protection, education, food supply and the ministry. This broad experience with clients has made it possible to provide the many examples used throughout the book. In writing these case studies, the confidentiality of my clients (both individuals and companies) has been protected. No company names are used. All individual names have been changed. Gender, appearance, and occasionally the industry have been changed in order to ensure privacy. My clients have consistently been my greatest source of information and inspiration. They have allowed me into the privacy of their lives, their relationships and their organizations with the often unspoken but most intimate of questions: “Can you help me with this?”. This question deserves an authentic, specific response and has always challenged me to bring forward the best resources available. I have drawn on years of observing, experimenting and learning in order to distill the best practices and processes presented in this book. They have been tested repeatedly in my direct work with hundreds of clients as well as by many close colleagues and their clients.. Psychological and spiritual influences have been intertwined for most of my life and have helped illuminate the path for my work. I was raised Catholic, with a mother who took both a mystical and psychodynamic view of experience. I discovered Martin Buber (I-Thou) when I was fourteen, Buddhism when I was fifteen and shortly after that, Sigmund Freud and Carl Jung. However, it was the human potential movement and the discovery of transpersonal psychology that sparked my commitment to psycho-spiritual integration. In my late twenties, I concluded my graduate work, became a psychotherapist and moved into a leadership role in creating a regional Psychosynthesis training center, working especially with health care professionals. This period marked a powerful convergence of psychology with spiritual influences such as Buddhism, mystical Christianity, eastern philosophy and yogic practices. These approaches and ideas became part of the background for an ongoing practice of meditation, body awareness, intuitive listening and creative expression. As I moved deeper into my practice as a psychotherapist in my thirty’s, I was influenced by social exchange theory, systems theory, and existentialism. Body-feelings-mind integration continued to be important and tools like Eugene Gendlin’s focusing technique were valuable resources. As a seasoned psychotherapist I became more interested in object relations theory, self-psychology, character disorders, shame and the intransigent aspects of personal change. These points of reference dovetailed with relational psychology especially in my work with couples, business partners and groups. In my forties I entered a period of creative awakening, and The Artist’s Way by Julia Cameron acted as a welcome catalyst. I drew inspiration from creative thinkers and artists of all types, especially from literary fiction and wrote an as yet unpublished novel. About nine years ago, as my focus shifted to complex business challenges and the emerging field of coaching, I received formal training as a coach. I focused a great deal on emotional intelligence, communication, work-life effectiveness and especially leadership development. These perspectives and the need to create practical solutions for leaders have led to the creation of this book. This book asks you to reflect, to consider new perspectives, to try new behaviors and to believe in your potential. Each chapter has one or more exercises, several questions for reflection and multiple suggestions for taking action. Allow yourself adequate time to work with these areas of personal application. Doing so will ensure that you will get maximum benefit from this book. This book was written with one goal: To show you how to become a more powerful and mindful leader—a leader deeply anchored in your inner truth and the core of your being. It will create the basis for a shift in identity that will expand how you see yourself and the world. The Essential You, which is expanded, powerful and relational (rooted in a respectful relationship with others). Part One will help you understand how these very different levels of identity operate. You’ll learn to identify four reactive patterns, used by the Limited You and four corresponding relational patterns, used by the Essential You. Containing, accepting and caring for the Limited You as you challenge it’s limiting stories. Working skillfully in the Contact-Zone™ (the space where people connect and have significant impact). Increasing your leadership presence and vision. Part Two will also show you how to collaborate and influence with skill, integrity and grace even with people who are difficult or frustrating. If you are an executive, manager, or have been identified as a person with high potential, this book will help support and keep you on the fast track. If you are a business owner, entrepreneur or leader of a non-profit, you’ll find the tools to stabilize your work-life effectiveness and find realistic limits that can also support your organization. If you are a helping professional or human resources professional, you’ll learn a very clear model for supporting the growth of others. If you are a social, political, or religious change agent, you’ll find a way to inspire others by communicating your vision more effectively. If you dream of being a better leader or if you just want to grow personally so you can guide your family, this book will provide a map and a process for doing so. Working with your enlightened edge will give you a distinct advantage at work, at home and in any area of your life where you want to perform at your best. As your awareness expands and as you grow more enlightened, your improved vision will guide your actions, leading to wiser choices and actions, and eventually, more joyful and life affirming outcomes. 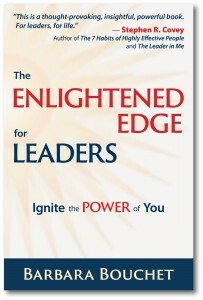 Learn more about what The Enlightened Edge for Leaders can do for you.